Guess who forgot to buy you something nice during their stay in Italy and had to resort to dashing into the speciality shop at the airport? Could have been your great aunt, elder brother or sister, or even the parents. Whichever relative it was who returned from the peninsula with a last-minute gift, the chances are that rather than an elegant bottle of grappa, or a round of Panforte, they came bearing a bright red tin of macaroons grandly named Amaretti di Saronno. Packaged up, the commercially-produced version of these almond-based bakes appear to have staked a claim at the back of a great many British storage cupboards. Because no sooner has the relative in question run out of holiday photos and been ushered out into the night air, than the underwhelmed recipient has taken the tin and deposited it somewhere behind the shrink-wrapped chorizo and manchego combination pack they got last year from another family member’s trip to Andalucia. 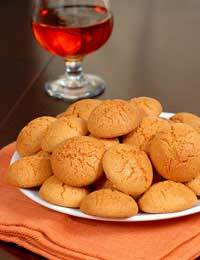 Let’s not be too disparaging about the humble amaretto biscuit, so often one of Italian food’s bridesmaids. The first bite into one may be pleasantly surprising. But let’s face it, one is more than enough. So what to do with the rest of the box? With cooks being urged to adapt recipes in order to help weather the worst the credit crunch can throw at the world, now is the time to dig out those cruelly abandoned biscuits and utilise them in a tempting afternoon dolce or after-dinner dessert that is guaranteed to soothe the fevered brow of the most nervous investment banker. The first stage in the cooking process is to smash up the amaretti biscuits. Don’t attempt this on a chopping board, otherwise you’ll be sweeping up the mess for days. Instead, take a large kitchen towel, place the biscuits in the middle, then pull together the sides of the towel and twist so that the biscuits form a dome at the bottom. Pick up a rolling pin and proceed to take out the day’s frustrations on the biscuits. After a few bashes – don’t get too carried away – empty the resulting crumbs into a bowl and pour in the rum. Leave the spirit to be absorbed by the biscuit crumbs for about an hour. In the meantime, melt the butter in a saucepan, add the sugar and mix together with a wooden spoon. Now add the yolks, the flour and the grated chocolate. Finally, pour in the amaretti/rum mix and give all the ingredients a good stir. Then smooth the mix into a shallow cake tin, pre-greased with some butter, and place in a pre-heated oven (180C/350F/gas mark 4) for 30-45 minutes. Use your finger to test the solidity of the cake, to ensure it is cooked but remains moist, and once ready remove from the oven and leave to cool on a rack. Before carrying to the table, dust with a generous amount of icing sugar, and plate up with some mascarpone or crème fraiche on the side. If serving as an evening dessert, the cake would benefit from being partnered with a good dessert wine, Italian of course. Do resist the temptation to open the Amaretto liquor as this will only result in almond overload. Then relax in your dining chair and congratulate yourself on a job well done: never have so many amaretti biscuits been sacrificed in so good a cause. But that’s not to say you should be putting a replacement tin on your relative’s shopping list next time they head off to Italy. After all, less is more. I need to know if I can freeze this cake asap please?